Is 2016 the Year of Adidas? 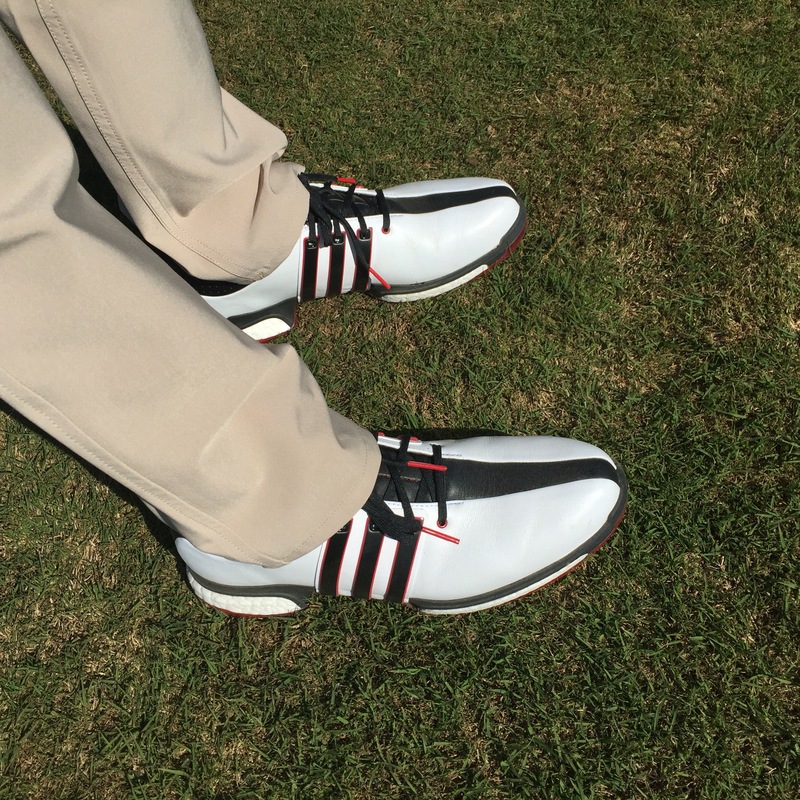 Apparently Adidas was inspired by the dominance Jason Day showed on tour in 2015 and wanted to go on their own run for 2016. They are the official apparel for the US Olympic Team (see previous post), launched the Tour 360 Boost Shoe and will introduce the Prime Knit Boost Shoe at The Masters next week. Adidas has capitalized on this early momentum with a very solid spring collection of Apparel. Adidas golf apparel has done very well positioned as a very sporty and athletic brand but appears to have matured a bit this year. While keeping the sporty fit and colors Adidas has created a soft place to land for the more fashion conscious customer. A couple features we really like in the early release are the contrast color accent on the collar, placket (button area) and the sleeve of the Climacool line and the new pattern styles of Climachill Shirts. ClimaChill remains one of the best performing shirts in hot and humid weather and a review on those will be coming in time for the heat. In Adidas and All Day J. Day (had to get that in there) style the fit is right down the middle. They look good on the athletic player as well as those with a more relaxed fitness regiment. The more athletic player should look at sizing down though just to see if the fit can improve. These subtle changes are great touches that make all the difference in looking your best on the golf course. Finally got to play a round in my adidas tour 360 boost! Very comfortable and very stable. That’s despite the fact that my left shoe had no spikes in it because my resourceful Assistant Pro “borrowed” them when we ran out of spikes in the shop and I forgot to replace them (oops.) 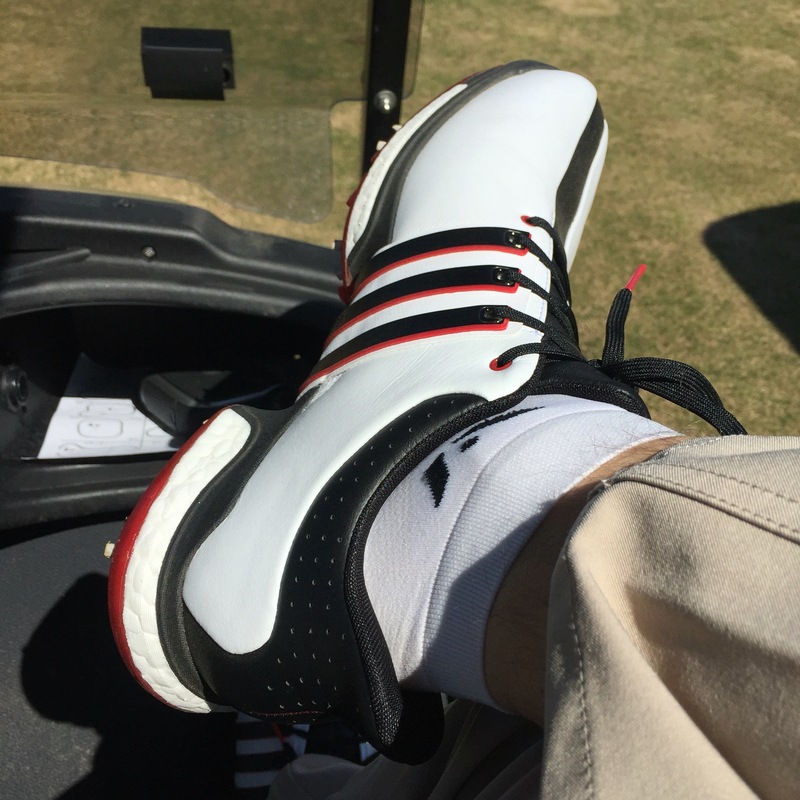 I didn’t actually notice until I looked at my shoe on the 10th hole, so that says someone about the comfort….or my obliviousness. I naturally choose the comfort explanation. Shoes didn’t quite match the outfit but it was a last minute call to sport the adidas shoes for the round. My early thought was that these would be the best shoes of 2016 and I don’t think that has changed. Some reports of some hot spots in the heel but didn’t experience this for myself. Maybe because I was rocking my superior Swiftick Socks. Adidas levels up the ClimaChill line with some very cool style looks. Glad to see Adidas branching out a little with some fashion style on the Climachilll. The Classy Alternative to Joggers? Ricky Fowler may be getting a lot of press for wearing joggers on the golf course, but I might get a little attention myself rocking the cropped pant on the golf course this summer. The issue at hand is really the shoes. It may be time for me to pull the trigger on a fresh pair of Biion Shoes. I have been wanting to try them for some time and this may be the perfect excuse to go sans socks on the course. Its either that or some classic adidas adicross shoes from adidas. FootJoy makes the best pants of 2016……..but these are not them. If you are like many who find the prospect of a three hour flight or trip to the grocery store way too daunting in anything other than the comfort of their pajamas….then we may have the golf pants for you! The FootJoy Houndstooth Pant is what my Assistant Pro Michael likes to call “fluffy pants.” It’s a highly technical term for way too much fabric in all the wrong places, especially below the knee. It’s too bad because I like the heavier weight of the pants and the design but the cut is just all wrong. Not to mention the comic length and size of the pockets ending just two inches above my knee (I am 6’1″). I even retuned them for another size thinking that was the problem but it was not. These are 34×32. The 32×34 I ordered first were way to tight in the waist and way too long. Just me and the two best Assistant Pros in the biz rocking team Matte Grey jackets. Likely the best piece of footwear to come out of the 2016 PGA show had to be the adidas Tour 360 Primeknit Boost. The Primeknit features all of the benefits of the Tour 360 Boost with the addition of a super lightweight and breathable knit upper. Now, this is a summer shoe (read: not waterproof) but with the lower areas of the shoe protected it should keep the feet dry of those dew sweepers out there. While the Primeknit construction creates lightweight and breathability benefits on the performance side it also makes this one of the coolest looking shoes I have seen in years. Based on the positive reaction from those around me I was not alone on this. Primeknit has been very popular in Adidas running shoes and like so many things this year adidas nailed the transition to golf. Now that I got you all excited about the shoe……..it’s time to tell you it’s not available until June. But, with so many great release from adidas golf at the show, at least this gives us something to look forward to.